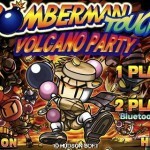 Bomberman Touch 2 – Volcano Party by Hudson is an awesome game that feels like an addition to the original. The goal of the game is to move through the caves and escape without being killed by the monsters or the lava. There are tons of power-ups including tornadoes, armies, speed upgrades, and bomb upgrades. When it was first released in the iTunes App Store, many people complained that the controls were too hard to use. Well, the people at Hudson listened. Just recently they released an update that makes the controls for the game much better. It used to be that to move your bomber, you placed your finger on the screen and motioned in the direction you wanted to go. The recent update has added a basic D-Pad to the lower left hand side of the screen. This method of controlling is much easier to use and much less frustrating. To lay out a bomb, tap the bomb icon in the bottom right of the screen. Collecting power-ups is just like the original. Simply walk on top of them. With the release of 3.0, you can now go head to head or play in co-op mode with your friends via Bluetooth. To make Bomberman a hit, your classic battles are also included just like the original only with more levels and power-ups. Walk around destroying blocks in your way to get to your friends and trap them with bombs to win. Bomberman Touch 2 is an awesome game that works flawlessly with Bluetooth. It is a great addition to your list of apps. With all the levels included in Bomberman, this is sure to be one of your favorite apps.